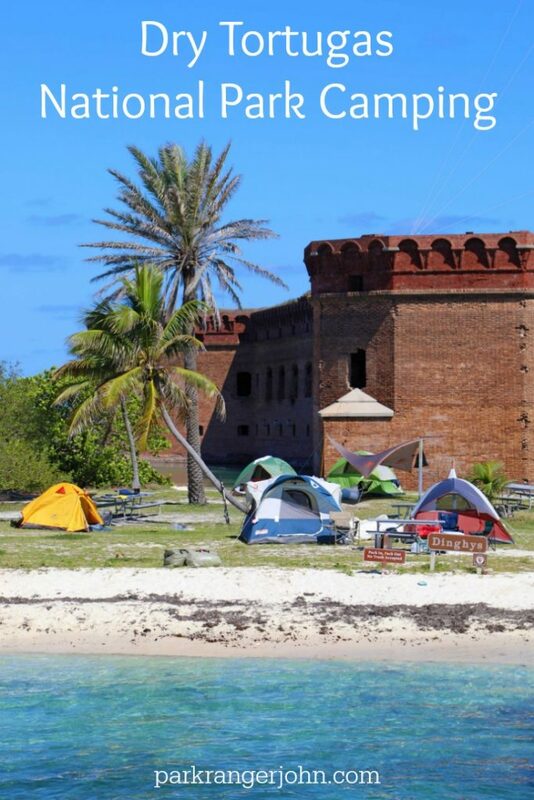 Dry Tortugas Camping requires planning, an expectation of a wilderness experience and one epic adventure! I say this is a wilderness experience as you are 70 miles from any piece of civilization! You are literally on a tiny island in the middle of the ocean and the only way to get back is by seaplane or by boat. The bright news is that those who make this adventure are in for an experience that they will never forget. Dry Tortugas National Park Camping allows you to experience this incredible park like very few get to do. Imagine having a tropical island to share with only a handful of other campers at night, feeling the warm breeze and an endless view of stars at night! 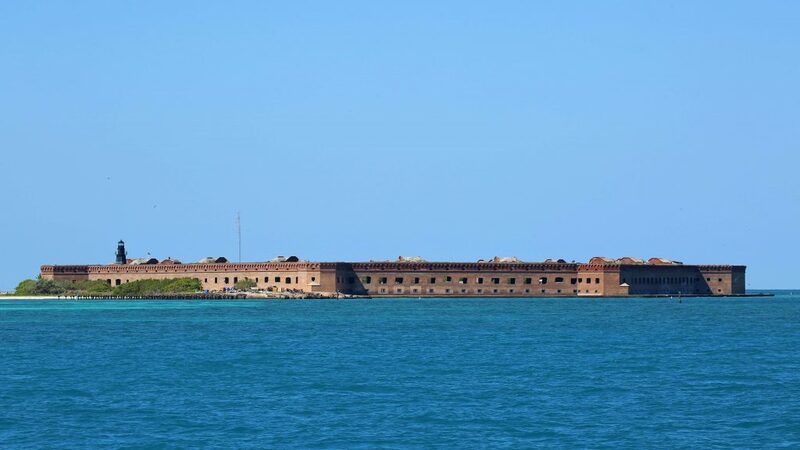 Make sure to also check out my articles on Things To Do Dry Tortugas National Park and Dry Tortugas National Park Travel Tips. Make an advance reservation and advise that you will be camping as there is only space for up to 10 campers per day. Advise the boat’s captain on the day of arrival that you are camping and arrive at the dock with all of your gear no later than 6:30 am. Gear must be packed into tote bags or bins- Please do not have a lot of little, loose gear. You will need to give your arrival and departure date at the time of the reservation as space is limited. Keep your gear to a minimum and required to have 60lbs. or less. This may sound easy but remember that you also have to bring all of your food and water too! Carry at least an extra days worth of food and water as sometimes weather can prevent the ferry from getting to the island. Carry at least 1 gallon of water per person per day. It is recommended that you bring 2 gallons of water per person per day as there is no water available on the island and there is little shade from the sun. You are required to pack in all of your food. This can be tricky as everything needs to be stored in a hard-sided container as the island has a rat population. Campers who fail to bring a hard-sided container for their food can expect to have rats eat their food, chew through tents, backpacks etc. to get to the food and have every camper near them ready to throw you off of the island. Any form of liquid fuels are prohibited (This includes propane). You are allowed to bring self-starting charcoal and Sterno cans for camping. Nothing is allowed to be hung from any tree, everything must be freestanding. Campsite space is very limited! You will have a picnic table and a grill plus all of your equipment and tents must remain within 10 feet of the picnic table. You are allowed up to 3 tents and 6 persons but remember that 10-foot rule from the picnic table! No more than 2 Canoes/Kayaks (no longer than 15 foot 6 inches) may be transported during each trip and has a $20.00 fee per boat. Bring heavy duty garbage bags as you are required to take everything back with you including garbage. You are required to have a Florida Fishing license if you plan to go fishing while on Dry Tortugas. They are not available at Dry Tortugas so make sure to plan ahead. You must pay cash for your campsite so make sure to plan ahead and have enough money and correct change. On the day that you return, you must have all of your gear on the dock and ready to go no later than 10:30 am. Your gear must also be free of sand. There are vault toilets available on the island but they are only open when the Yankee Freedom is not in port. You must use the restrooms on the Yankee Freedom when it is in port. 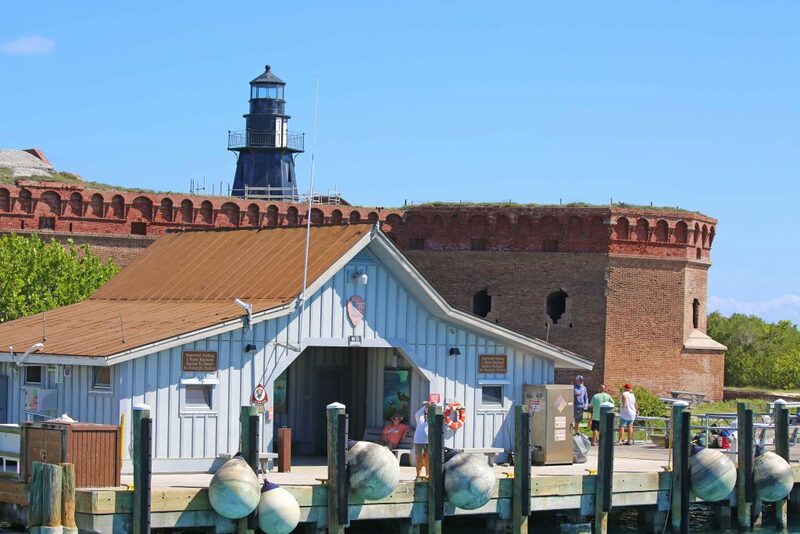 Private Boats: Overnight anchoring is only allowed in the area of sand and rubble bottom within 1 nautical mile of the Fort Jefferson harbor light and must not block any designated channel. Overnight anchoring is not permitted at any other location in Dry Tortugas National Park. The nightly fee of $15 per camping site is collected through a self-service fee area that is located in the campground. A 50% discount applies to holders of the Golden Age or Golden Access Pass. Group camping is a nightly fee of $30 per camping site. Camping Fees can only be paid at the park by cash or check no matter your mode of transportation to the park. 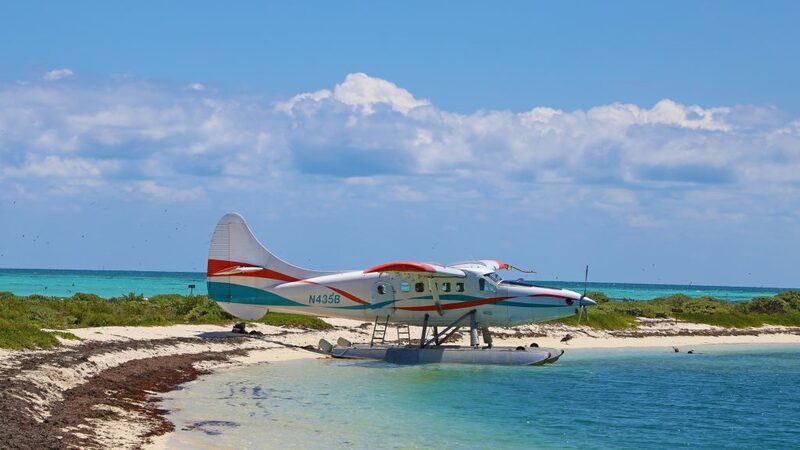 Seaplane or ferry concessions do not collect camping fees. Call (305)-242-7700 to obtain a Group Campsite Reservation Application, or click here. There are no Reservations and is a first come-first serve park. You do however have to make reservations with Yankee Freedom which has a 10 camper limit per day. This is the headquarters for the park, not the actual island. 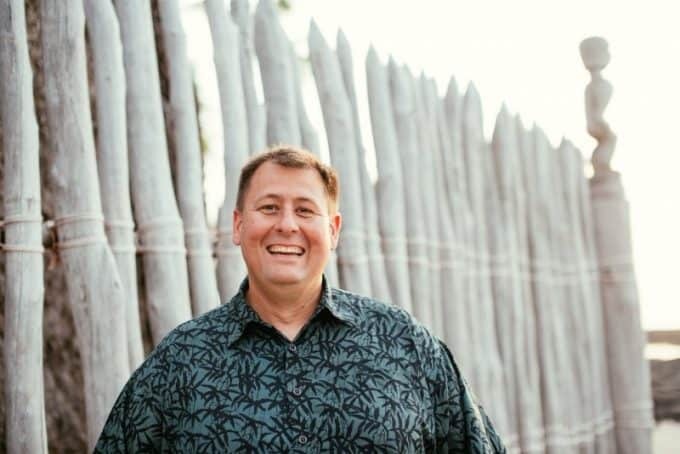 are permitted on Garden Key but not inside Fort Jefferson. are not permitted on any other key in the park. must be on a leash and under physical control at all times. waste must be removed by the owner from the park. 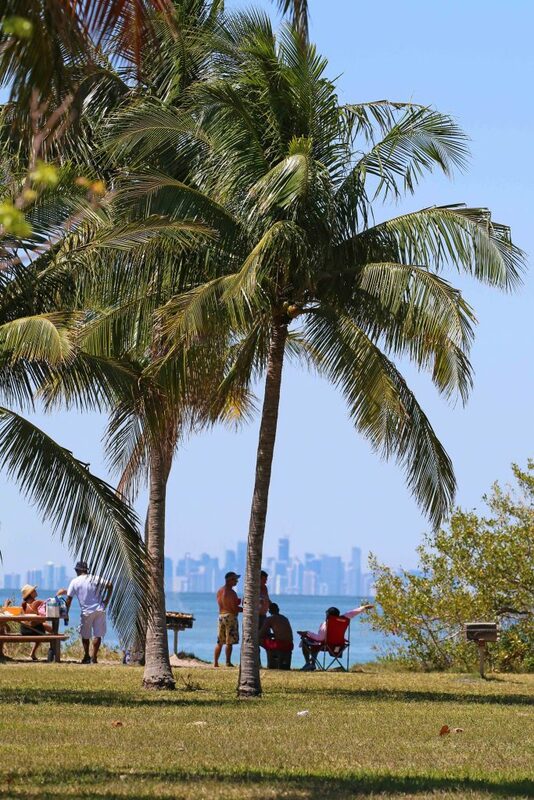 View of Miami from Boca Chita Key, Biscayne National Park. You can explore a lighthouse, go hiking & BBQ! 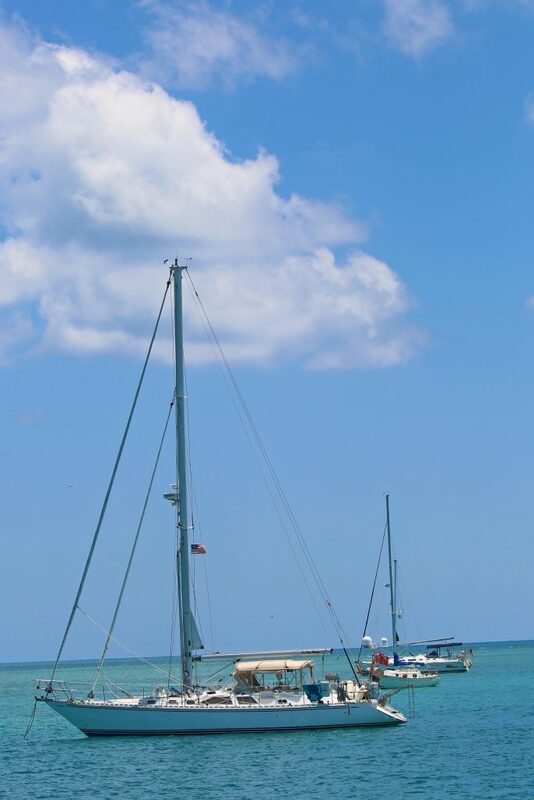 Make sure and pin this pic to make it easier to find when you plan your Dry Tortugas National Park Camping trip!